Posted on February 27, 2007 by Alicia Bay Laurel	in Blog. My website and blog run on cutting edge free software, set up by my friends and webhosts, Dumpling Feed, aka Richard Schave and Kim Cooper, whose wedding you saw on this blog last June. 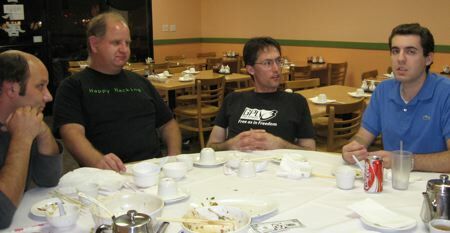 Fittingly, when the inventor of free software, and its biggest promoter, Richard Stallman, came to Los Angeles to lecture at USC and Caltech, Richard and Kim honored him with a stay in their home and a dumpling feed at their favorite dim sum restaurant, 101 Noodle Express, in Alhambra, a suburb east of downtown Los Angeles that is home to many Chinese-Americans and their businesses. Standing between Richard and Kim is Iwa, who was managing 101 Noodle Express the night of our feast. We discussed election fraud at length, including the proprietary software of the voting machines. Richard Stallman maintains that the USA should use nothing but paper ballots, since they are recountable. “Even if the optical scanners are hacked, we can count them by hand,” he said. I concur. On the left is software developer and musician Lucas Gonze, on the far right is web and computer consultant Josh Cain. I forget the other two guys’ names, and hope someone will email me and fill me in. So here I am with Richard Stallman: the Queen of the Freaks meets the King of the Geeks. 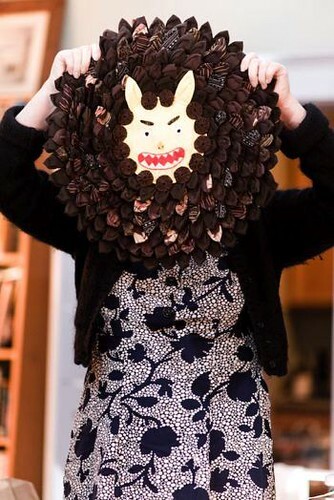 Before we all went out for dim sum, I gave Kim the gift I’d bought her at Tata Bazaar in Naha City, Okinawa on Halloween – a shisa (an Okinawan gargoyle) made of fabric (most are made of ceramic or stone). It looks great with her collection of Naugas. 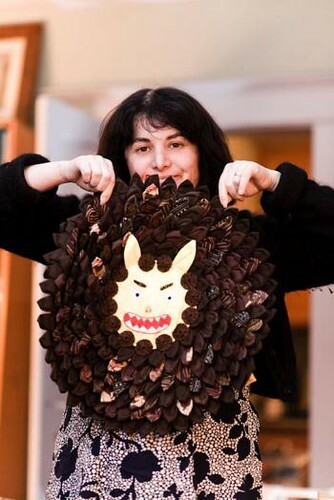 Photographer Meeno Peluce, on assignment photographing Richard Stallman, took the shots above of her playing with it. 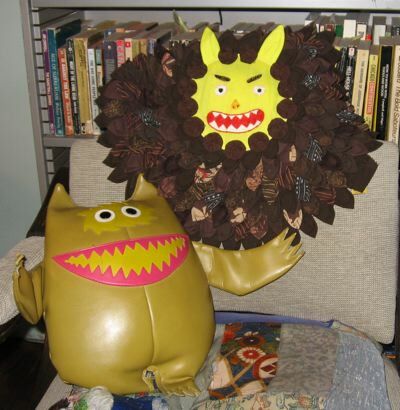 I took the one below, of the Nauga and the Shisa living toothily ever after in Kim and Richard’s library. 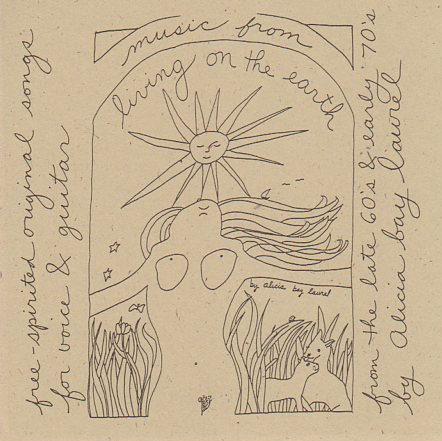 ← The Original Art and Layout of Living on the Earth is for Sale!